Johnson County summarized sales potential within an appropriate drive time of each retail district. The County Appraiser for Johnson County, Kansas, was looking for a method for independently verifying that assessed valuation rates for retail properties were equitable across the county. Paul Welcome, County Appraiser for Johnson County, Kansas, and his staff understand that variations in wealth and population density across the county affect property values. The county needed to ensure that its valuations of retail properties accurately took into consideration these variations across the jurisdiction. Locations that Welcome refers to as “wealth corners” are commercial districts in affluent, highly developed locations. County staff uses a higher value per square foot when calculating the assessed values for properties in wealth corners. Welcome was searching for a method to verify differences in per-square-foot value that would be easy to implement, use current data, and capture the business appeal of specific locations. After discussing this problem with Esri staff, Welcome determined that the location analytics processes used by businesses might meet his needs. Businesses use location analytics for site selection, merchandising, and other business decisions. The web-based data enrichment tools in ArcGIS make it simple to get information about the people, places, and businesses in a specific area or within a certain distance or drive time from a location. The power of cloud computing provides instant access to thousands of up-to-date demographic, consumer spending, lifestyle, and business data variables. For example, a developer can choose a site for a shopping center using web-based tools that summarize variables, such as total population, median household income, other businesses nearby, and spending habits, for an area within a specified drive time of candidate sites. Once a site is selected, analysis of nearby market segments and spending habits can help determine the ideal mix of stores for the shopping center. An analysis is only as good as the data that goes into it. A wealth of data is available online from Esri to support location analytics. Thousands of variables are available for population, lifestyles, spending, market potential, and other characteristics. 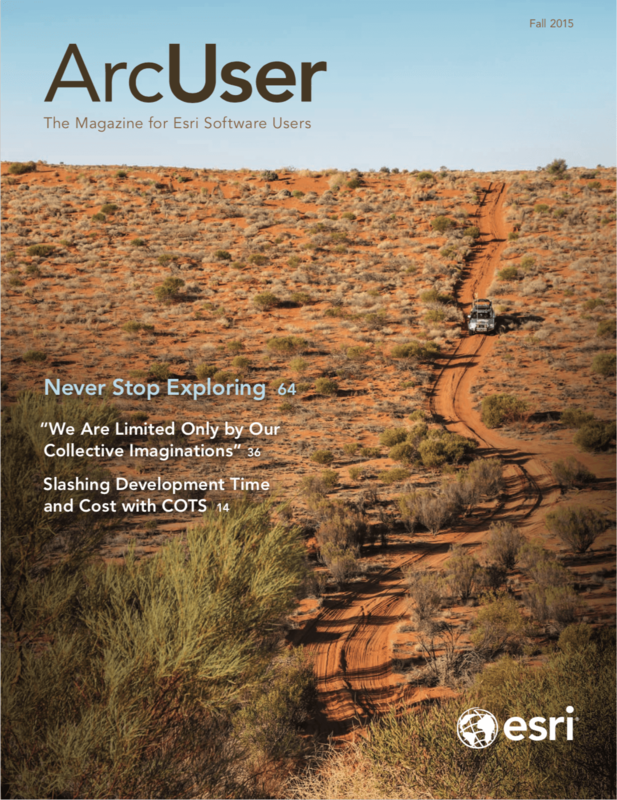 The beauty of the web-based approach used by ArcGIS is that basemap and many other data layers available from ArcGIS Online are maintained by Esri. Tools for performing location analysis also exist online, are always available, and are ready to use. Outputs from these tools can be accessed from any device and easily exported to other systems. The county began looking at specific datasets on businesses and populations available from Esri to use in its analysis of retail property values. To measure retail activity in the areas surrounding retail properties in the county, Johnson County looked at the Total Retail Sales database from Esri’s Retail MarketPlace database. Another option for analyzing retail activity is Esri’s Consumer Spending database, which provides information about actual spending for retail goods as well as other categories such as apparel, financial, food and beverage, entertainment and recreation, and household goods and services. Predictive analysis, which could be added using Esri Market Potential data, compares area demand for products and services to national averages. Population and lifestyle data in the vicinity of a business can also be useful in defending valuations in an appeals process. This data provides information on ages, marital status, and residency of the people who live, work, and shop near the property being valued. In an independent, blind study by credentialed demographers in 2012, Esri’s population data was ranked the most accurate. Esri’s Tapestry Segmentation lifestyle data provides other perspectives on nearby populations. Tapestry data classifies US neighborhoods into 67 unique segments based on demographic and socioeconomic characteristics. Knowing the product, service, and media preferences and favorite activities of residents and consumers can help estimate the revenue generated by a retail property. To come up with a process for ranking locations for retail businesses in the county, Kevin Skridulis, on the county’s GIS team, worked with Scott Porter, manager of commercial real estate valuation, and Welcome. First, the team determined that total retail sales was a good variable to use for ranking as it reflects the number of people in an area, their wealth, and how much they spend. They decided they would look at spending near those locations based on drive time. Realistically capturing the accessibility of a location to nearby consumers required choosing an appropriate drive time. This decision was affected by the county’s valuation process, which uses a different price per square foot for big-box retailers than for smaller retail stores. Because trade areas are complex and cannot be cleanly delineated, Johnson County staff determined that a five-minute drive time provided a realistic measure of the quality of the market around a location for a big-box store. For a smaller retail outlet that might not pull customers from as far away, a three-minute drive time captured the characteristics of the area most likely served by the smaller store. To capture the estimated total retail expenditures within the drive time for each retail district, Johnson County staff used the GeoEnrichment functionality in Esri Community Analyst. This software-as-a-service (SaaS) mapping solution hosted by Esri includes both GIS capabilities and access to thousands of demographic, health, economic, education, and business data variables and creates reports using any of the thousands of metrics available. The county chose Community Analyst for its ease of use. Its ability to easily export variables by census geographies was another factor important for a related project. 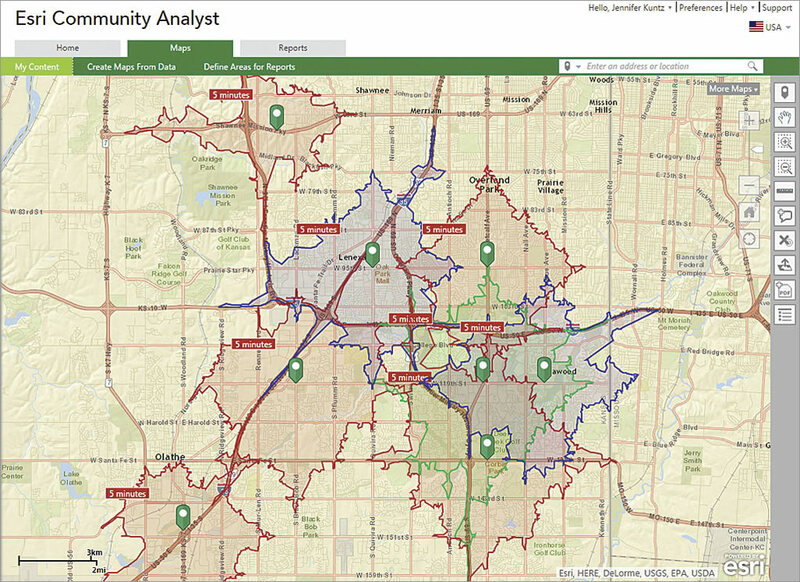 Community Analyst is just one of several options in the ArcGIS platform for enriching data with up-to-date demographics, consumer spending, lifestyle, and other business data. Other options include the Enrich Layer tools in ArcGIS Pro and ArcGIS Online and the Enrich Data tool in Esri Maps for Office. This functionality can also be accessed through the ArcGIS APIs. Johnson County staff compared retail goods spending rankings to their value per square foot rankings to determine if they were accurately capturing the relative desirability of retail property locations. This comparison showed a very strong correlation between the two rankings and was consistent with an earlier study by Bob Gloudemans, an assessment consultant hired by the county. The previous study found a statistically significant correlation between wealth corners and the county’s value per square foot for retail properties in those locations. These results confirmed that location analytics shows promise for enhancing the appraisal process. Johnson County has continued testing location analytics workflows. Early results show promise for enhancing its business processes.